Well it has been a while since I have been following you all, at least actively reading and COMMENTING on all your blogs. I have been trying desperately to get back into quilting after a long ‘drought’ period. I have missed it soooooooooo much!!! Since October I have been working on this very small, table-top sized quilt, which I intended as a wall hanging. 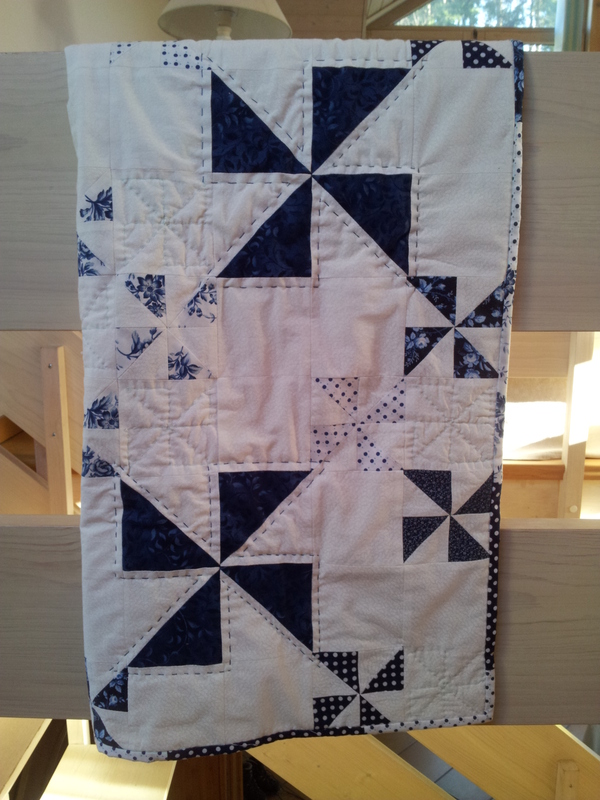 As it is only my second quilt I have ever made I am not too ashamed of how long it has taken. 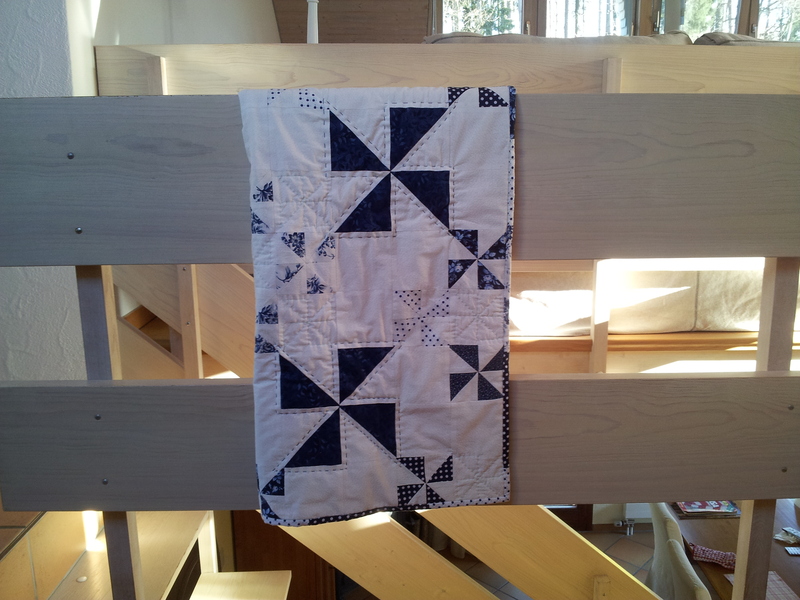 And although it was considerably smaller than my first quilt, I did do the quilting by hand, which I had to learn anew. Right after piecing the squares and half-square triangles, to make the pinwheel quilt top, I also decided to put my machine in the shop so she could recover from all my torture, after which I decided, before I messed her up again, I should better learn exactly how she works before trying to quilt another quilt on her. So to make a long story short, that is when I decided I was going to finish this baby by hand. 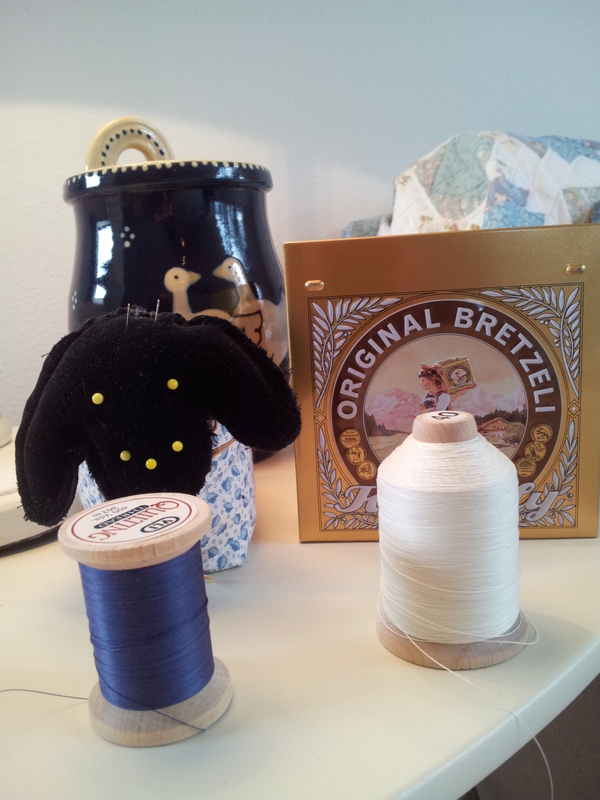 I know it should have been quicker, but I learnt a lot of new techniques, and it is not easy to find hand-sewing tutorials in one place. After discovering the joys of Craftsy’s online class, and with the help of a great deal of online tutorials, you tube videos and a few pdf handouts from the Martingale publishers, I finally managed to figure it all out. Finally my quilt is washed and in one piece and all I have to do is iron it (yuck! ), take some better shots of it, document it and make the label. But for now, I will leave you with a few impressions of it in it’s finished state. 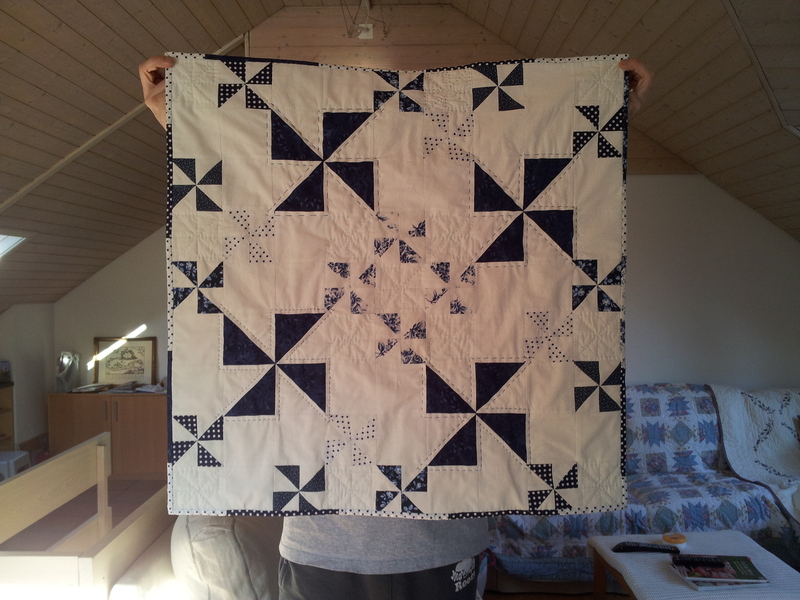 I cannot tell you how much I love hand quilting and hand sewing, after having finished this quilt. I will most probably return to the machine for the piecing process, but I will most definitely quilt my next quilt by hand! It is something that brings more ‘peacefulness’, for lack of a better word, I love the look of hand quilting despite the fact that I greatly appreciate the effect of machine quilting and think it is definitely an art I would love to learn. Oh and by the way the pattern is free from Moda and was designed by Sarah B Designs. I believe, it is actually a 36 inch by 36 inch baby quilt. It was an excellent quilt for a beginner and together with her own blog notes on how to cut the fabric from yardage instead of the Moda charm packs, it was really easy to figure out. Much easier than the first quilt I did with all the sashing!!! The hardest part was figuring out the binding!! Which would also have been easier, if I hadn’t chosen to do straight grain binding from fabric scraps! 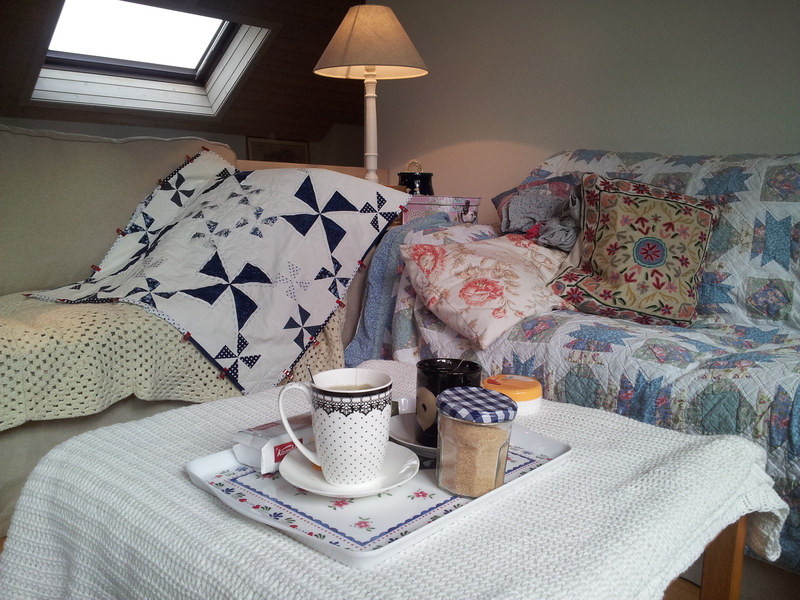 Anyway I hope I have maybe inspired any non-quilter’s out there to try to quilt and any machine quilters to pick up a needle thread, switch on their favorite movie and get comfy on the sofa. Hope you have a great day, and please let me know what creative projects you’ve been busy with!